Regarding the inks, you should have a look at our ink section of the forum, with all sorts of topics related to inks, and also keep an eye on the PIF part, you can be very lucky sometimes, specially that we are working on a very very special PIF soon. Thanks for the tip, I'll make sure to keep an eye out. Best regards to you too! If you PM me with your mailing address, I might be talked into sending you some samples of my KWZ inks, also some other iron gall inks I have in my stash. Thank you so much once more! This was one of the nicest things to have happened to me lately. DIAMINE is a widely-available brand of ink, and comes in a large range of colors. We have some good, generous member in Brazil. Access their knowledge. I do have some Diamine inks on my shortlist, though it might take me a little while until I can get them. I'll look out for fellow Brazilians here, thank you. Welcome! Happy birthday coming up. 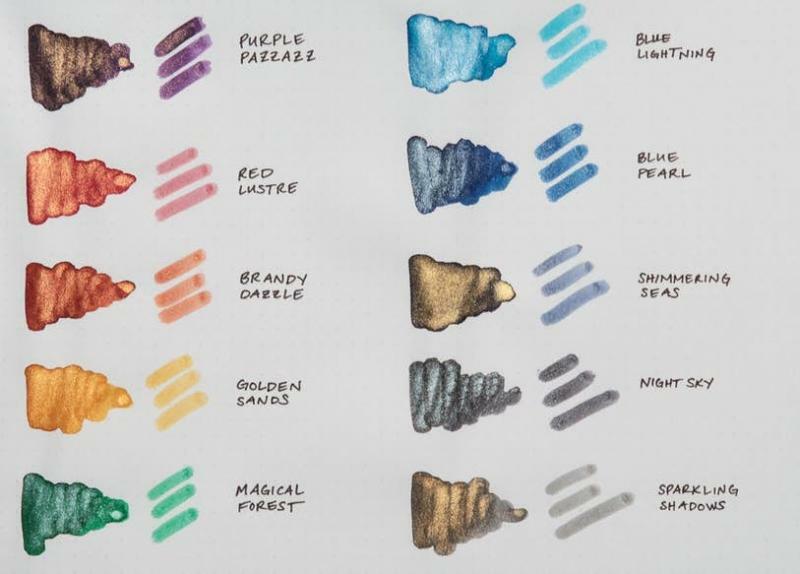 I second the Diamine ink suggestion, try their shimmertastic ink. Edited by omarcenaro, 11 March 2018 - 13:45. Hi - I've tried quite a bit of ink. Kept getting samplers from Goulet and spent way too much $$$ on various bottles. Inks are such a personal matter. My inks tend to be tied to pens and, at times, a personal story. For example, I use J. Herbin Eclat de Saphir when the letter or note is associated with my mother. That being said, I've been very happy with the diversity and overall quality of Diamine. Asa Blue, Emerald and Imperial Purple are daily writers. Asa Blue is really my go to ink. For Blue-Black I keep coming back to Shin-Kai. As for black, like many others I've read/seen, the only Ink I use is Aurora Black - unbeatable. Inks are so personal and can convey quite a bit. At times, nothing better than using my Mt Fuji 3776 with some Encre Rouge Parfum Rose by J. Herbin. Final Advice: try ink. test samplers. the more ink you try, the more you'll find yourself returning to some personal favorites. I think I've spent more $$$ on ink than many of my pens. What can I say, it is addictive. I have two different KWZ IG inks. I highly suggest using a pen flush type fluid to clean your pens after using these; I used plain tap water in an unimportant pen and the reaction caused quite a bit of solids to precipitate out of the ink remnants. I do love the ink but IG requires extra care. Oh wow these are gorgeous! Thanks for the swabs, I promise to study them carefully. At a glance, Purple Pazzaz and Shimmering Seas seem like the ones I'd use the most... I also really like Brandy Dazzle and Blue Lightning, but those seem like they put down a lighter line? I like my lines fairly saturated since my eyes aren't the best. Hey! Thank you for all the advice, and the very useful links. I've bookmarked them. I agree completely with inks being addictive. I already have quite a few but I want so many more... Unfortunately, I can't buy any samples (or, well, I could, but the shipping to my country would be prohibitive), so I rely on lots and lots of different reviews to make my choices. So far it's worked pretty well. I've loved all but one of the inks I have. As for Diamine, I have a short list of their inks I really want to try... at the top of the list being Ancient Copper and Syrah. I have actually tended towards using more purples and bluegreens in my writing, but I'm pretty sure I'm going to love those two. I might get to try some Yama Budo soon. I can't wait! Thanks for the warning! That must have been such a shocking experience, I can't even imagine. I did put aside a couple of pens I'm willing to use riskier inks with but I'd still be quite upset if something happened to them. I couldn't find any pen flush to buy so I'll google how to make my own. Who knows, maybe there's even IG specific pen flush? Hey Guys. This Is Mathew From India.